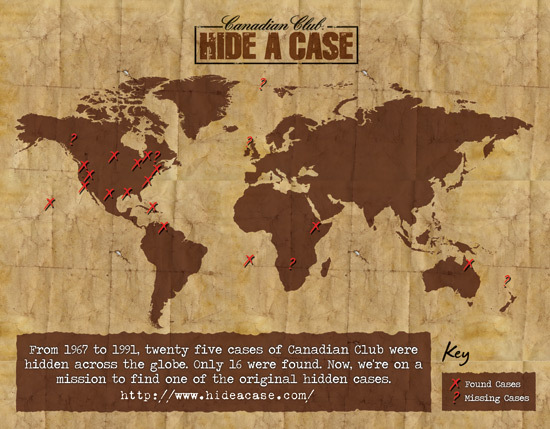 Last Monday, while I was in New York trying to locate my missing Saturday night, Canadian Club announced the return of Hide A Case, the global adventure campaign in which consumers searched for hidden cases of Canadian Club Whisky in locations around the world. 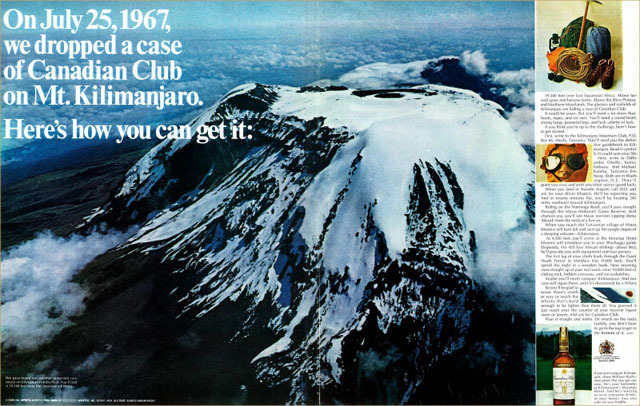 From 1967 through 1991, 25 cases of Canadian Club were hidden in exotic locales that included Mt. Kilimanjaro, Angel Falls, the Arctic Circle, and perhaps the most dangerous of all, the urban jungles of Manhattan. To date, 16 of the hidden cases have been discovered, many of them found with the help of clues revealed in a legendary series of ads published in the 60s, 70s and 80s. A classic Hide A Case ad from the 60s. The resurrected Hide A Case campaign features online challenges and a video competition, from which Canadian Club will select 8 adventurers to hunt for one of the long-missing cases, culminating in a U.S. vs. Canada race to win $100,000. Round One is underway, featuring online trivia questions and puzzles. Earn at least 50 points, be one of the top scorers, and proceed to Round Two, which begins July 9th. During this round, contestants submit videos explaining why they should be part of the final round. Judges will select the top 30 videos, and along with the public, will vote on 4 Americans and 4 Canadians to compete in Round Three, the global expedition. In April 2011, the final eight will travel the world, solving clues that will lead one of them to the missing case. All 8 contestants will receive $12,500 each, and the ultimate winner will claim $100,000. For more information and complete contest rules, visit www.hideacase.com.